I learned a long time ago the value of a good self-management meeting, especially when I’m feeling overwhelmed or fearful. The only attendee (other than God) at my self-management meeting is me! In our times, there are lots of reasons to feel overwhelmed and fearful. We’ve had our fair share of natural disasters. We see threats of war and terrorism. We’re overwhelmed by the sheer amount of media messages we receive each day, let alone all the tasks we need to accomplish. Throw in family stress, health issues, and work challenges, and you’ve got the perfect storm. If that’s the way you’re feeling, let me validate you. Your feelings of being overwhelmed or fearful make sense to me! I love the Psalms because the Psalmist experienced those feelings as well. Psalm 42 is one of my favorites! After describing desperate tears for God, the Sons of Korah, the writers of the Psalm, wrote, “Why, my soul, are you downcast? Why so disturbed within me? Put your hope in God, for I will yet praise Him, my Savior and my God” (Psalm 42:5). Those words describe perfectly what happens in a self-management meeting. to get a grip on your emotions and restore your trust in God. What do you do in your self-management meeting? Listen to Your Heart. Ask yourself, why am I upset? Or, why am I fearful? Ask the Holy Spirit to help you understand what’s going on in your heart. Then, listen. As thoughts come to mind, write them down. Don’t overthink; just write whatever comes to mind. Identify your Top Fears. When you’re finished writing out all your thoughts, read them over and see if patterns emerge. List your top fears or the top stressors that are making you feel overwhelmed. Remind yourself of the promises of God. Next time you feel fearful, write down your fear. Then make a list of the promises of God. 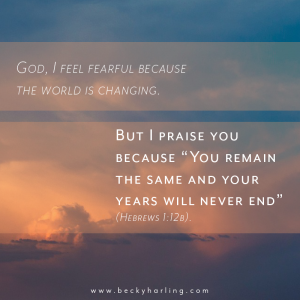 You might write, “God, I feel fearful because the world is changing.” Next to that write, “I praise you because ‘You remain the same and your years will never end.’” (Hebrews 1:12b). Or you might write, “I feel fearful of financial disaster.” Next to that write, “My God will meet all your needs according to the riches of His glory in Christ Jesus” (Philippians 4:19). Or, if you feel like a task is too hard for you, you might write, “God, I can’t do this!” Next to that fear write, “I can do all things through Him who gives me strength” (Philippians 4:13). Friend, the bottom line is this: these are challenging days. But Jesus is enough! He will supply all that you need to live a victorious life in Him. So next time you feel yourself sinking, hold a self-management meeting and re-fix your focus on Him.